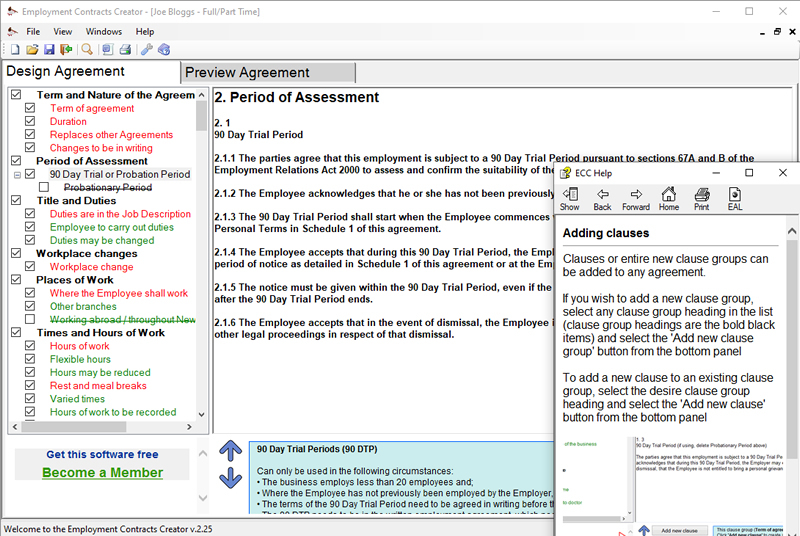 Fully customised Employment Contract Agreements at a click of a button! 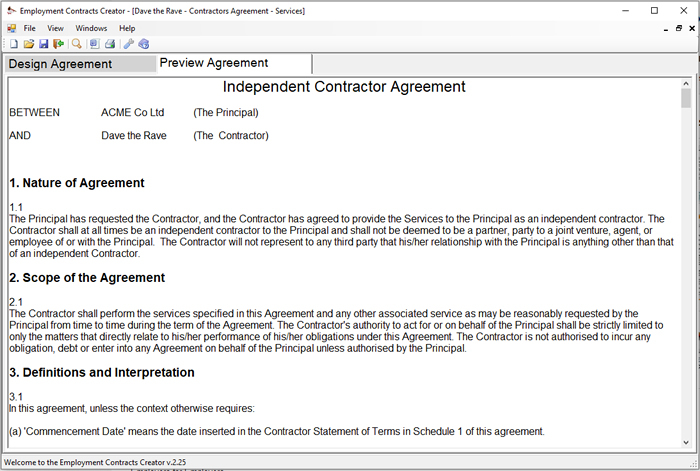 The Employment Contracts Creator (ECC) is a PC based software package which enables you to create your employment contracts with ease. Starting with a comprehensive contract, simply 'untick' any clauses you don't want, complete the Personal Terms schedule using our wizard, and the software does the rest for you. 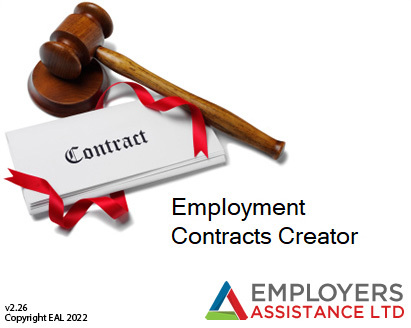 ECC is your complete tool for creating every type of employment contract. Designed specifically for the New Zealand market under the Employment relations Act. Changes following the Health & Safety At Work (2015) Act are incorporated, along with our recommended clauses subsequent to the Employment Standards Bill in 2016. Our latest version of the ECC (v2.22 May 2017) has been developed following changes in legislation, case law and best practices. Our in-house legal team has modified our Individual Employment Agreements to accommodate these changes and provide the best protection for business owners. Changes to the 90 Day Trial Period, when it takes effect, how to use it and how to avoid the pitfalls. 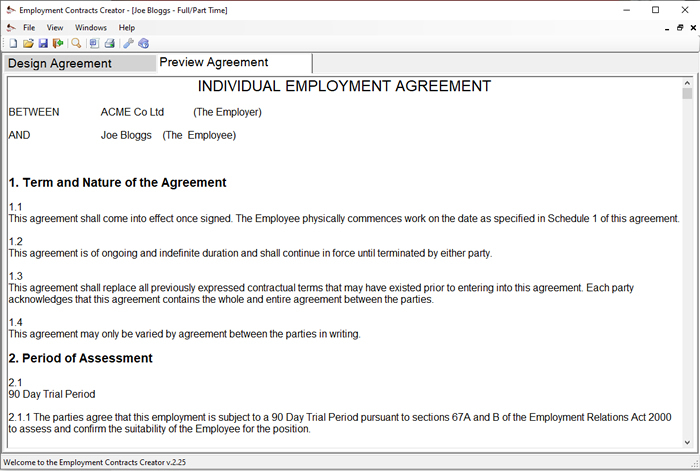 How to negotiate and put an employment agreement in place for an existing Employee, if they have never had one. What to do if the Employee refuses to discuss or sign the agreement. 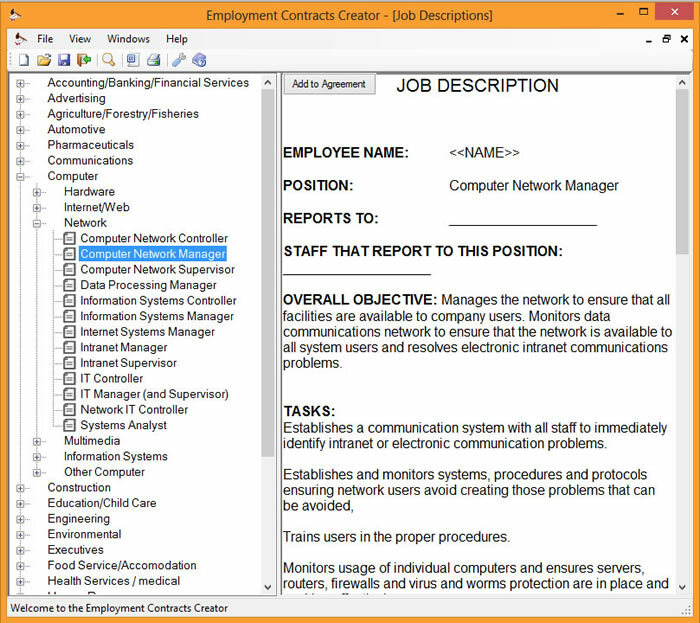 Job Descriptions database. Over 600 position descriptions to include in your Agreements. We pride ourselves in providing Employers and Business owners with the most comprehensive Agreements. The best protection in employment dispute situations begins with having the best Agreement in place with your staff. To this end our team of industry experienced and qualified specialists constantly look to improve our Agreements in line with legislation, what is happening in the courts and what offers our clients the best protection.